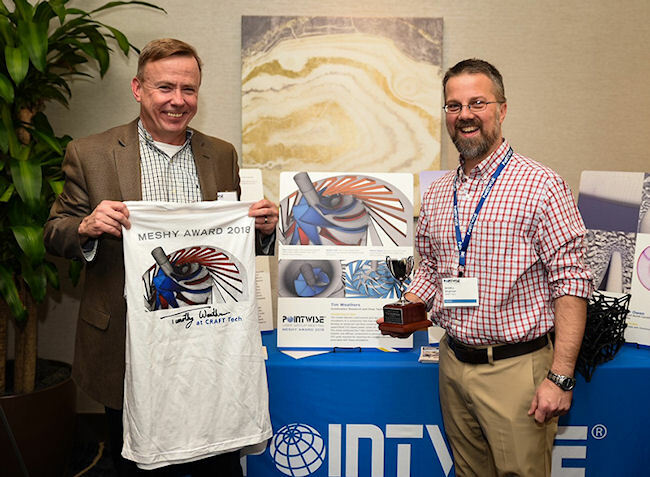 Tim Weathers from CRAFT Tech is this year’s winner of the Pointwise Meshy Award for his mixed-element unstructured grid of an advanced power system compressor. He was presented the Meshy Award trophy at the Pointwise User Group Meeting 2018. The Meshy Award competition recognizes the artistry and technical skill of Pointwise users. “CRAFT Tech has been using Pointwise for many years and has always pushed the boundaries of CFD meshing technologies applied to challenging problems. Tim’s winning grid is a perfect example of using the flexibility in Pointwise to match the grid type locally to the geometry, flow physics, and accuracy requirements to get the best answers in the least time, which also means it is a beautiful mesh,” said Dr. Rick Matus, Pointwise executive vice president. Tim Weather’s grid is a mixed-element unstructured grid, constructed for CFD simulations of a compressor test loop as part of a study to develop an advanced real-fluid numerical framework for modeling supercritical CO2 based power cycles for advanced power systems. This study employed the T-Rex hybrid meshing method for the impeller and diffuser components to generate the high-quality CFD grids required for resolving the complex thermodynamics associated with these simulations. Tim Weathers is an assistant research scientist at Combustion Research and Flow Technology, Inc. (CRAFT Tech). His education includes a B.S. in Aerospace Engineering from The Pennsylvania State University in 2015. He specializes in simulation modeling techniques such as computational fluid dynamics and molecular dynamics. His main area of focus includes grid generation and analysis for turbomachinery cases with an emphasis on cavitation reduction, multi-phase effects, and particulate interactions. Current work is focused on molecular dynamics analysis of mixtures present in rocket engines and CFD analysis of the supercritical CO2 power cycle.